Sunderland are set to lose top scorer Josh Maja to Bordeaux. Josh Maja looks set to complete a £3.5million move to Bordeaux - with the Black Cats hoping to splash the fee on Will Grigg and Grant Leadbitter. Bordeaux are on the verge of completing a deal that will see Maja join the Ligue 1 club this week. A number of Bundesliga sides are also keen on the youngster, who has scored 16 goals in all competitions for the Black Cats this season, but it seems that he will be moving to France instead. There has been interest from the Premier League and the Championship but after weighing up his options, Maja has now decided to move overseas. Maja’s current deal expires at the end of the season and has been free to negotiate a pre-contract agreement with a foreign club. 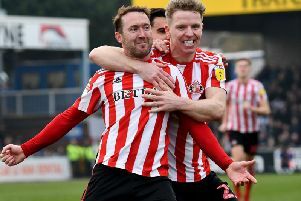 That was the worst case scenario for Sunderland, who would receive a relatively paltry sum in compensation, and has meant that owner Stewart Donald has tried to push through a permanent switch before the transfer window closes. Sunderland have had to make a judgement on whether they believe Maja can make a significant impact between now and the end of the season, or whether his desire to move means it is better to search for a replacement. Will Grigg remains a target, with the Wigan Athletic striker's ankle injury not as bad as first feared. Sunderland have had three bids already rejected for the 27-year-old, but will return with a fourth bid armed with an increased transfer budget. Sunderland will look to sign two strikers this month now, after Jerome Sinclair’s loan deal was cut short. And they are also keen on pushing through a deal for former midfielder Leadbitter, who has fallen down the pecking order at Middlesbrough. Manager Jack Ross has identified central midfield as an area he wants to strengthen, despite having a number of players who can play in that position, and sees the 33-year-old as a strong option as he seeks promotion back to the Championship. Leadbitter left the Black Cats in 2009 to join Roy Keane's Ipswich Town. Middlesbrough are closing in on a deal for John Obi Mikel, who is available as a free agent. That could clear the path for Leadbitter to leave, with an emotional homecoming to his boyhood club - who he made more than 100 appearances for - a possibility. The fee for Maja is expected to rise to £3.5million with clauses and add-ons, while Sunderland are hoping to include a sell-on clause in the transfer. Black Cats boss Jack Ross admitted last week he would be keen on the idea of loaning Maja back should he depart, but that is unlikely as it stands. On Tuesday night Ross said there would be clarity to the situation 'very soon'. "I want clarity and I believe that clarity might come over the next couple of days," he said. “As things stand, I can’t bring that to you.